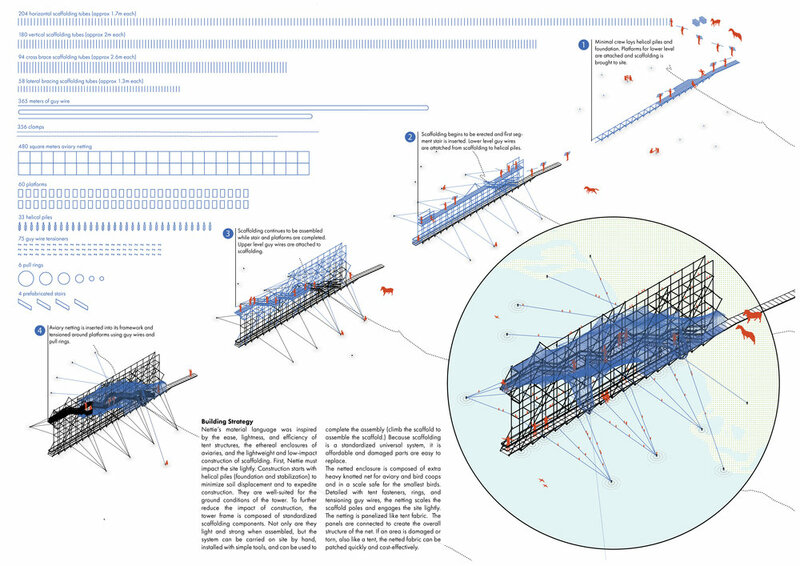 The Nettie project presents a twist on bird observation. For many, to see multiple bird species, their experience is limited to a visit of a bird aviary in a zoo. These aviaries capture birds and mimic environments in a netted tent. 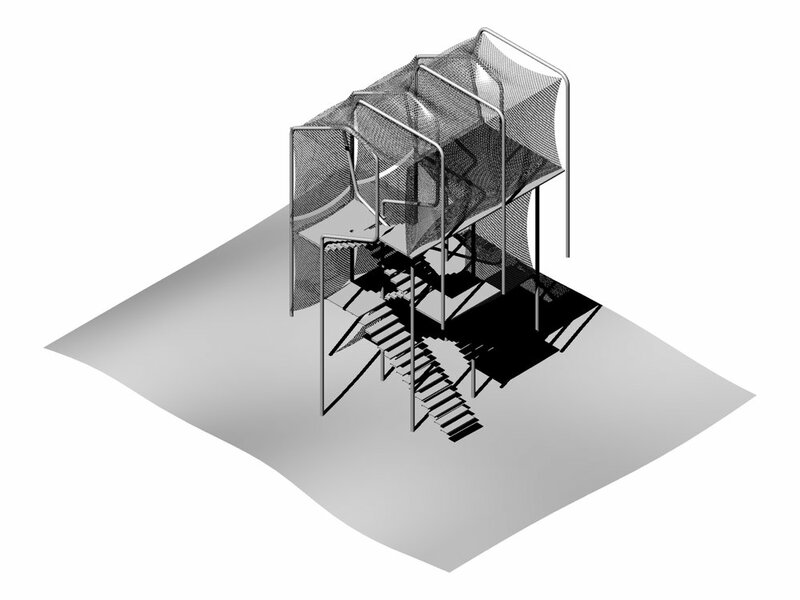 For the Pape Nature Park, Nettie proposes an inversion of the aviary experience. 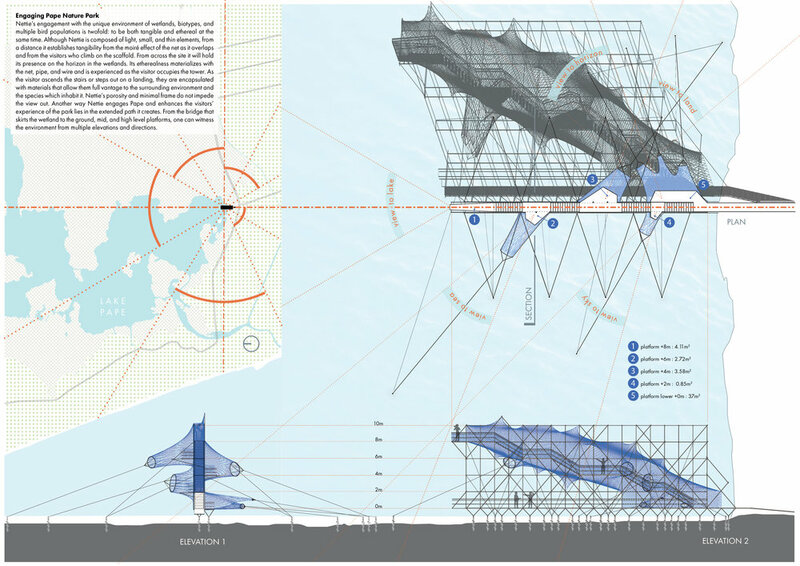 To celebrate the expansive natural and diverse wetland environment, and to augment the ability to observe over 250 species of migrating and nesting birds, the tower encases the observer in netting, a “hominiary,” so to speak. Spatially caught in the net, the observer can see out into the park from any point along the tower path; not a flitting passerby will be missed as they climb to the top-most platform. At landings, apertures are ringed to direct views down to the water, up to the sky, or to the horizon where water and sky meet. Nettie also establishes presence as an iconic landmark for the Park while also providing unimpeded 360° views for the observer. Long and slender, the tower stretches across the site, the stairs along the north/south axis, the landings to the east and the west to the sea. Ethereal and expansive, Nettie stretches across the landscape to provide vantage to all Pape Nature Park offers. 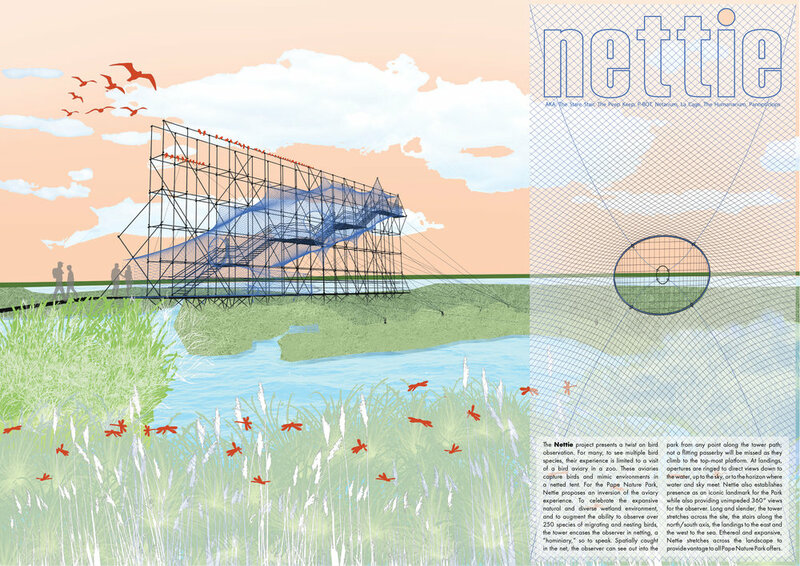 Nettie’s engagement with the unique environment of wetlands, biotypes, and multiple bird populations is twofold: to be both tangible and ethereal at the same time. Although Nettie is composed of light, small, and thin elements, from a distance it establishes tangibility from the moiré effect of the net as it overlaps and from the visitors who climb on the scaffold. From across the site it will hold its presence on the horizon in the wetlands. 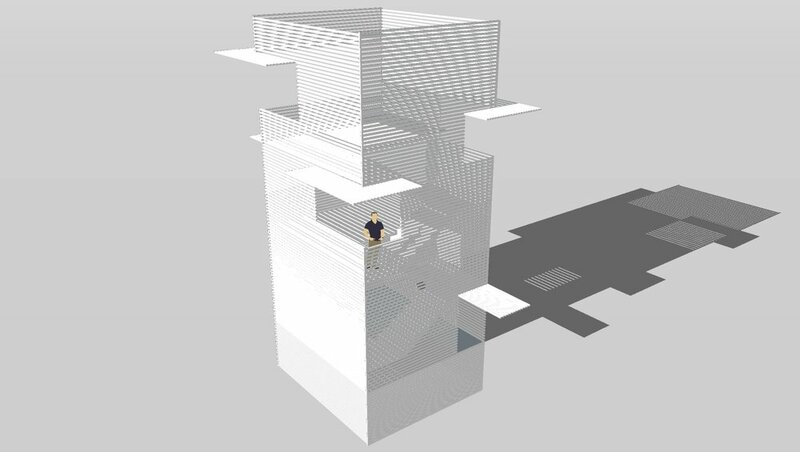 Its etherealness materializes with the net, pipe, and wire and is experienced as the visitor occupies the tower. As the visitor ascends the stairs or steps out on a landing, they are encapsulated with materials that allow them full vantage to the surrounding environment and the species which inhabit it. Nettie’s porosity and minimal frame do not impede the view out. Another way Nettie engages Pape and enhances the visitors’ experience of the park lies in the extended path it creates. From the bridge that skirts the wetland to the ground, mid, and high level platforms, one can witness the environment from multiple elevations and directions. Nettie’s material language was inspired by the ease, lightness, and efficiency of tent structures, the ethereal enclosures of aviaries, and the lightweight and low-impact construction of scaffolding. First, Nettie must impact the site lightly. Construction starts with helical piles (foundation and stabilization) to minimize soil displacement and to expedite construction. They are well-suited for the ground conditions of the tower. 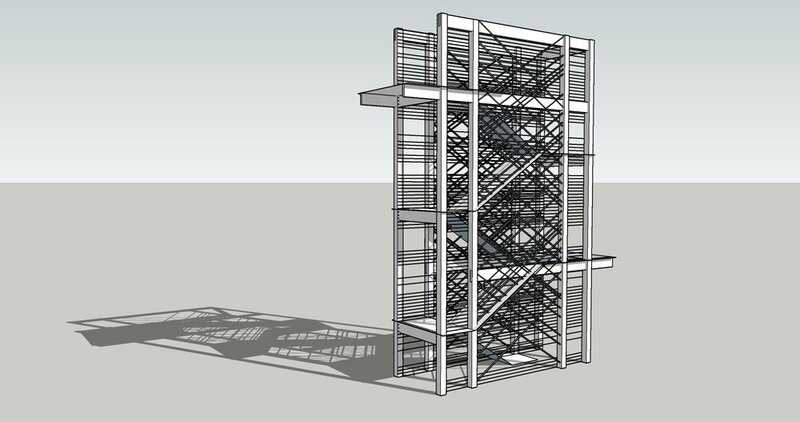 To further reduce the impact of construction, the tower frame is composed of standardized scaffolding components. Not only are they light and strong when assembled, but the system can be carried on site by hand, installed with simple tools, and can be used to complete the assembly (climb the scaffold to assemble the scaffold.) Because scaffolding is a standardized universal system, it is affordable and damaged parts are easy to replace. 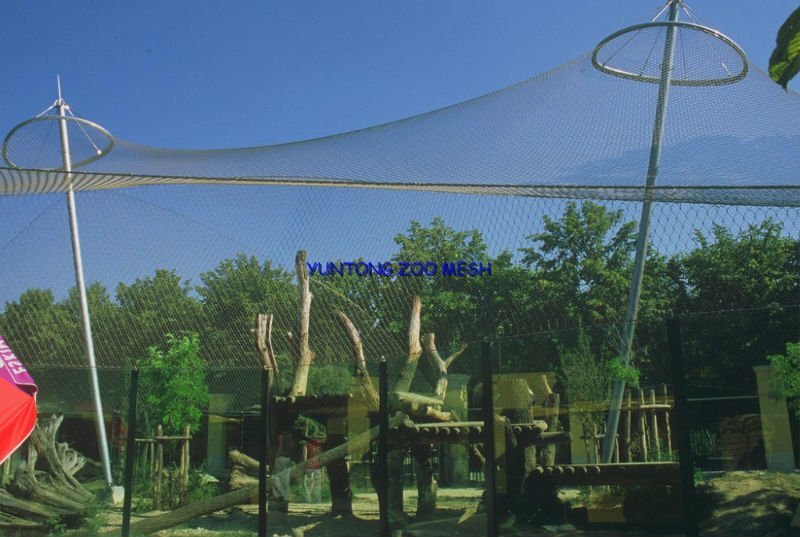 The netted enclosure is composed of extra heavy knotted net for aviary and bird coops and in a scale safe for the smallest birds. Detailed with tent fasteners, rings, and tensioning guy wires, the netting scales the scaffold poles and engages the site lightly. The netting is paneled like tent fabric. The panels are connected to create the overall structure of the net. If an area is damaged or torn, also like a tent, the netted fabric can be patched quickly and cost-effectively. To disturb the beauty of the natural environment at the Pape Nature Park seems counterintuitive. However to maintain and preserve a natural environment from human development requires the environment to hold value for humankind; that can only be established through humankind witnessing the value. Nettie attempts to disturb lightly with the purpose of providing space for witness to occur, for vantage to be given. From afar it establishes the place to visit (iconic landmark): from within it enhances the value of the unique biodiversity by providing unimpeded vantage.